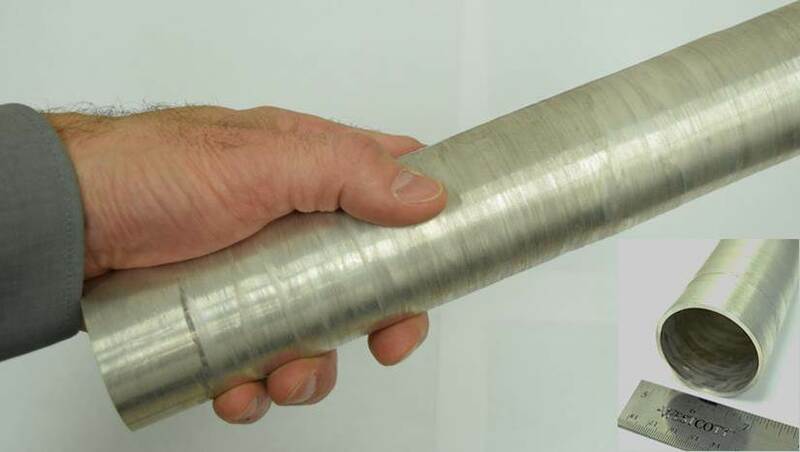 A 50-mm-diameter tube with a 1.5-mm-wall thickness created from a solid chunk of magnesium alloy using PNNL's ShAPE™ extrusion process. Enlarge Image. Magnesium—the lightest of all structural metals—has a lot going for it in the quest to make ever lighter cars and trucks that go farther on a tank of fuel or battery charge. Magnesium is 75 percent lighter than steel, 33 percent lighter than aluminum and is the fourth most common element on earth behind iron, silicon and oxygen. But despite its light weight and natural abundance, auto makers have been stymied in their attempts to incorporate magnesium alloys into structural car parts. To provide the necessary strength has required the addition of costly, tongue-twisting rare elements such as dysprosium, praseodymium and ytterbium—until now. A new process developed at the Department of Energy's Pacific Northwest National Laboratory should make it more feasible for the auto industry to incorporate magnesium alloys into structural components. The method has the potential to reduce cost by eliminating the need for rare-earth elements, while simultaneously improving the material's structural properties. It's a new twist on extrusion, in which the metal is forced through a tool to create a certain shape, kind of like dough pushed through a pasta maker results in different shapes. Initial research, described recently in Materials Science and Engineering A, and Magnesium Technology, found the PNNL-developed process greatly improves the energy absorption of magnesium by creating novel microstructures which are not possible with traditional extrusion methods. It also improves a property called ductility, which is how far the metal can be stretched before it breaks. These enhancements make magnesium easier to work with and more likely to be used in structural car parts. Currently, magnesium components account for only about 1 percent, or 33 pounds, of a typical car's weight according to a DOE report. "Today, many vehicle manufacturers do not use magnesium in structural locations because of the two Ps; price and properties," said principal investigator and mechanical engineer Scott Whalen. "Right now, manufacturers opt for low-cost aluminum in components such as bumper beams and crush tips. Using our process, we have enhanced the mechanical properties of magnesium to the point where it can now be considered instead of aluminum for these applications—without the added cost of rare-earth elements." Researchers theorized that spinning the magnesium alloy during the extrusion process would create just enough heat to soften the material so it could be easily pressed through a die to create tubes, rods and channels. Heat generated from mechanical friction deforming the metal, provides all of the heat necessary for the process, eliminating the need for power hungry resistance heaters used in traditional extrusion presses (see YouTube video: https://youtu.be/rsjkZZv-irg). The PNNL team designed and commissioned an industrial version of their idea and received a one-of-a-kind, custom built Shear Assisted Processing and Extrusion machine—coining the acronym for ShAPETM. With it, they've successfully extruded very thin-walled round tubing, up to two inches in diameter, from magnesium-aluminum-zinc alloys AZ91 and ZK60A, improving their mechanical properties in the process. For example, room temperature ductility above 25 percent has been independently measured, which is a large improvement compared to typical extrusions. "In the ShAPETM process, we get highly refined microstructures within the metal and, in some cases, are even able to form nanostructured features," said Whalen. "The higher the rotations per minute, the smaller the grains become which makes the tubing stronger and more ductile or pliable. Additionally, we can control the orientation of the crystalline structures in the metal to improve the energy absorption of magnesium so it's equal to that of aluminum." The billets or chunks of bulk magnesium alloys flow through the die in a very soft state, thanks to the simultaneous linear and rotational forces of the ShAPETM machine. This means only one tenth of the force is needed to push the material through a die compared to conventional extrusion. This significant reduction in force would enable substantially smaller production machinery, thus lowering capital expenditures and operations costs for industry adopting this patent pending process. The force is so low, that the amount of electricity used to make a one-foot length of two-inch diameter tubing is about the same as it takes to run a residential kitchen oven for just 60 seconds. Energy is saved since the heat generated at the billet/die interface is the only process heat required to soften the magnesium. "We don't need giant heaters surrounding the billets of magnesium like industrial extrusion machines, said Whalen. "We are heating—with friction only—right at the place that matters." Magna-Cosma, a global auto industry parts supplier, is teaming with PNNL on this DOE funded research project to advance low cost magnesium parts and, as larger tubes are developed, will be testing them at one of their production facilities near Detroit. PNNL's ShAPETM technology is available for licensing and could help to make a dent in the auto industry's magnesium target, and slim down cars which currently weigh an average of 3,360 pounds. Sponsors: U.S. Magnesium LLC supplied the material used in this study. Financial support for this work was awarded through the MS3 (Materials Synthesis and Simulation across Scales) Initiative at Pacific Northwest National Laboratory. S.N. Mathaudhu was supported in part by the National Science Foundation under grant no. 1463679.